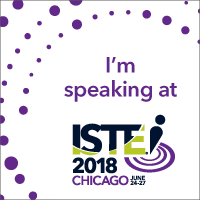 My first session at ISTE2015 is called Flipped PD: Creating Teacher Buy-In and Modeling Technology-Rich Professional Development. What a mouthful. 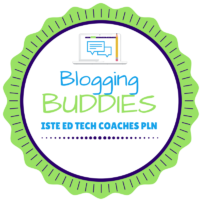 Still, very interested in this topic, especially as I step into the Instructional Technology Coach roll. One of my primary responsibilities is Professional Development (PD), and getting that buy-in from the staff is going to be of vital importance. One of the cool things Laura Conley did to start the session was give us a padlet that contained all of the materials for the session, including the presentation. What a great use for padlet! Her padlet can be found here. ThingLInk is a simple tool for adding interactive elements to an image. Basically, it takes an image and adds interaction points to them. These interaction points activate on mouseover to show a link, another picture, additional text, or video. 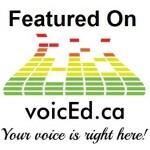 Laura suggests using ThingLink to create agendas for your PD. It makes the agenda more visual, which is good for most people, and it makes it a little more engaging for staff. She also says that the agenda needs to be given to your teachers before the PD (preferable a week or so before). For people like me, to whom “planning” means looking over the PPT (or creating the PPT) the night before or morning of. Still, her argument is valid, in that knowing what you are going to learn ahead of time is very useful. Lastly, she focused on Socrative. I’m not sure how useful I actually believe this would be in a PD. I’m not really comfortable with giving my staff quizzes. Something about giving the staff a quiz seems condescending to me. However, she uses it as her exit ticket for her staff. It has questions like “Did you understand the content?” “Which tool(s) will you use in your classrooms.” It eliminates the right/wrong factor and becomes a fairly simple way to get feedback about the PD. Still, I think using an Excel Online Form (or Google Form) would give you better results. Overall, this was a pretty good session. I do wish we could have seen more examples of what Flipped PD actually looks like with her staff. I did like the different and interesting ways she used some of the technology tools (like padlet and ThingLink). I can see myself using those for PD. Still, I don’t feel like I actually learned how to flip my PD as much a couple extra tools to include in my existing PD. Anyways, I will continue to make posts for each of my sessions. I have another one coming up in about an hour that I will post about then.